It's been about 5 months since we began working on Marshmallow Madness. A lot has happened since then-- a lot of work completed, a lot of deadlines met, and a lot of new things learned. This being the first video game title I worked on that's going to be published, I have to say it was an incredible experience in a lot of ways. 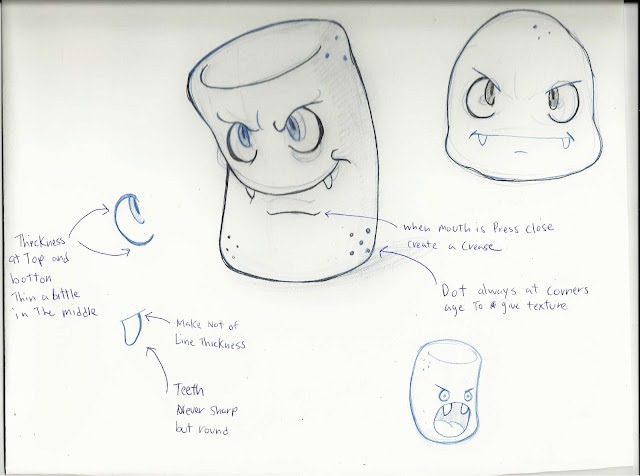 We had been talking about a tower defense type game based on marshmallows so I was pretty excited about the idea before we had even started production. 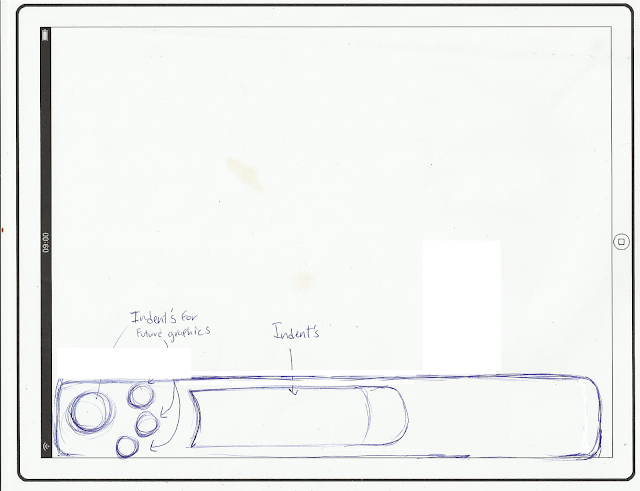 Depending on how long you've been keeping track of this blog, you might remember the first assignment: to create promotional artwork for the game. 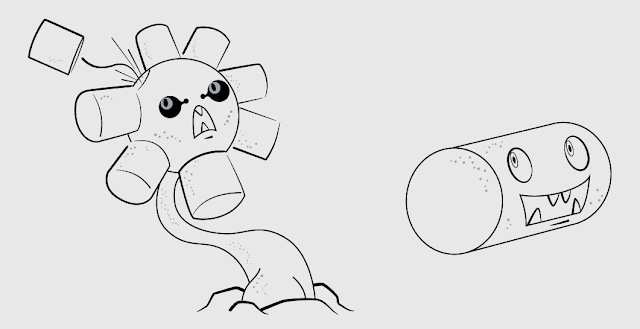 My art director sent me a pencil sketch and instructed me to create finished vector artwork based off of the designs. This assignment was a bit like a training session since I didn't actually have to concept anything from scratch yet. These designs weren't actual assets to be used in game, but were more for having visual concepts to show potential customers/players before the game was built. My director taught me a lot about what sorts of things you have to keep in mind to create professional looking game art--line weight, creating a focal point, and appropriately colored outlines to name a few. This is also where he told me to really begin thinking about lighting, and the point in which I really started to study subsurface scattering. Thanks to his critiques I was able to polish up the creatures, which resulted in the final version posted above in the third image. Later came the time to do concepts from scratch! 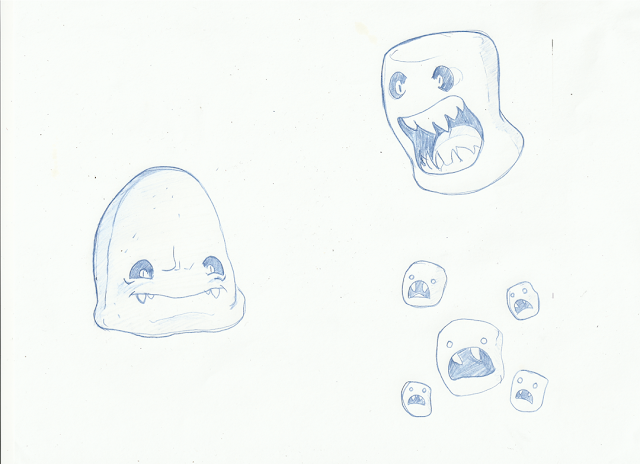 Another artist and myself were told to create concepts for enemy marshmallow units. I was excited because this was the first time I'd ever had the opportunity to act as a concept artist, but nervous for the same reason. It's easy to think your ideas are good when you're doodling in your sketchbook in private, but here was the chance to get actual feedback on whether or not they were fit to be in the final product. We were given a lot of freedom on what the enemies could look like so I tried several different types. I thought about what each could do if it were on the battlefield of a tower defense game. 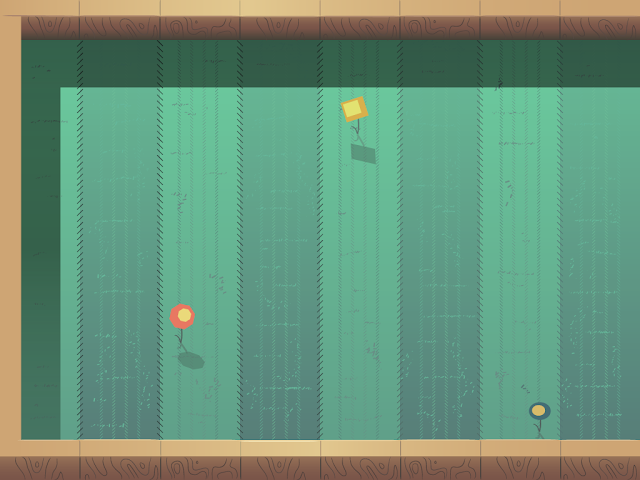 Shoot projectiles from afar, travel underground for periods of time, block attacks from the player--each design was based on a specific function. 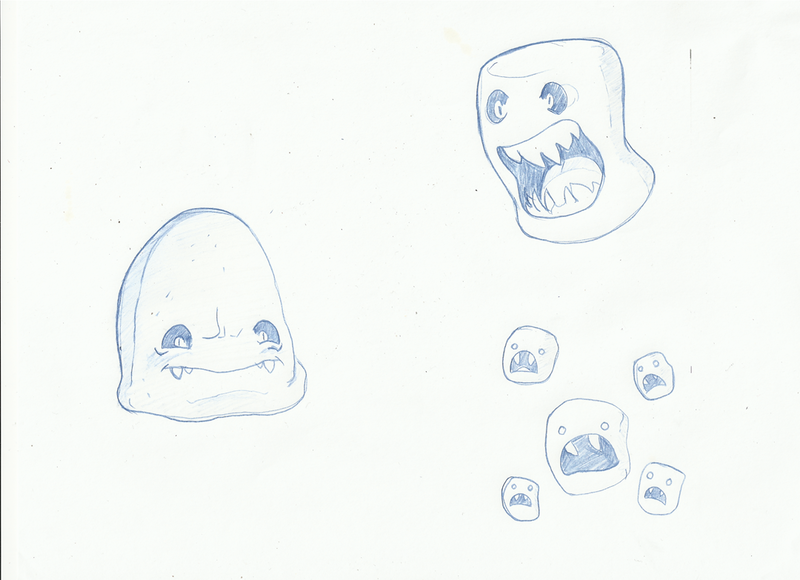 This is also where I was introduced to the task of staying within a specific style (based off of the design notes in the pencil sketch from my director)--the eyes in particular had to be drawn a certain way on the enemies for the sake of cohesion. Concepts done in linework this time since colors would be decided later. We had enemies, but we needed a protagonist for the player of course. 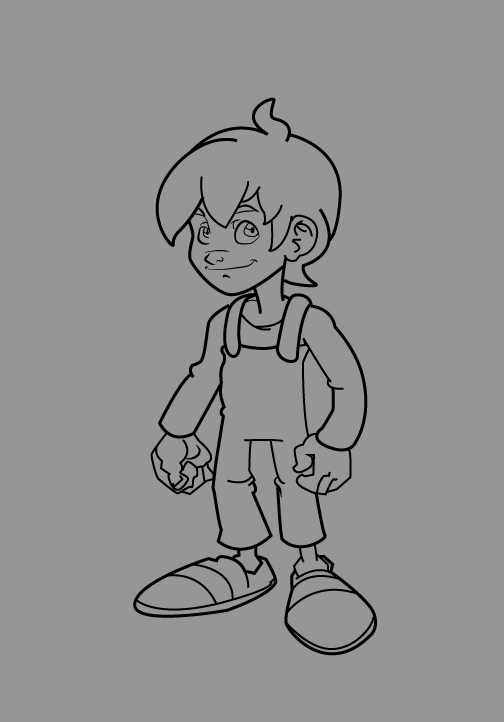 The 2D artists were told to create a protagonist that was child-like in stature. We had to make at least 5, it was a 48 hour assignment. This is easily one of my favorite assignments though since I've wanted to design characters for a living for as long as I can remember. What makes a good protagonist? I think on some level players want someone relatable. Even if the character isn't the same age, race, or gender as you, something about the persona they exude should be appealing. As artists we're given the task of showing personality through posture, wardrobe, and other visual cues. Unfortunately, none of my designs were chosen for the final protagonist, but I was still glad for the opportunity to design the lead role. It forced me to think about these things to be prepared when the opportunity rises again. My art director gave me more critiques to think about which helped tremendously--creating convincing character poses with weight, where to emphasize line width, and what details matter in a character sheet. Next we moved into the environment stage. The next thing on my to-do list was to create a concept of a field where the gameplay would take place. 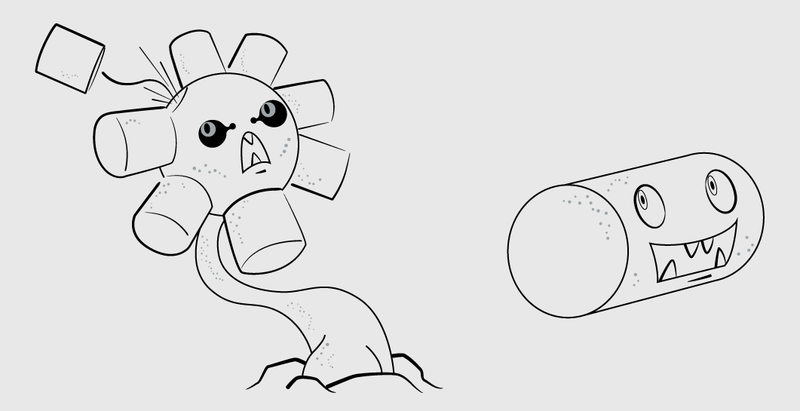 As a tower defense game, we were told to look at Plants Vs. Zombies for inspiration. 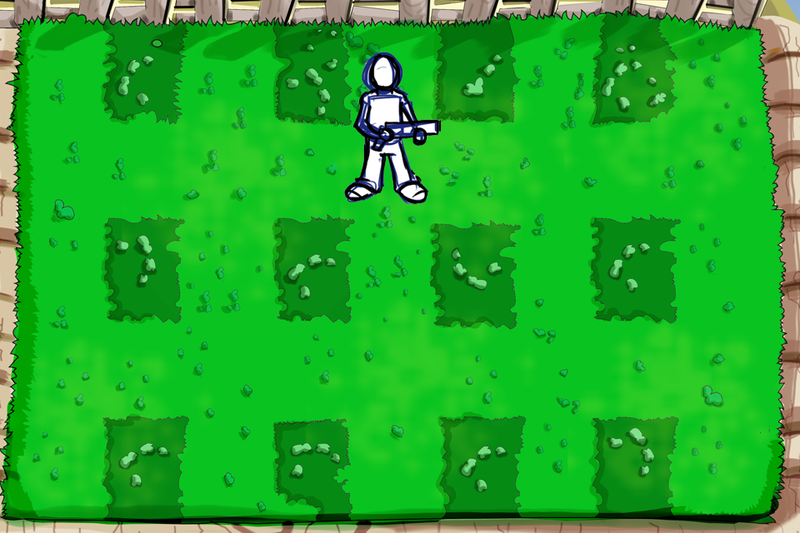 The stripes in the grass were an idea for a sort of measuring system, to gauge how far away enemies were from the player. I was thinking of a sort of fantasy schoolyard for the setting since the protagonist is young. To be completely honest, I struggled with this assignment. I didn't realize it at the time, but my lack of perspective knowledge really hurt me on this one. I also felt myself creating something that was too plain for a professional product. I began to feel the strain of having a weak visual library to draw from, and not using nearly enough reference. Something my director promptly reminded me of once we had a chance to discuss this assignment. I realized I had to get out of the habit of trying to do too much from imagination this early. 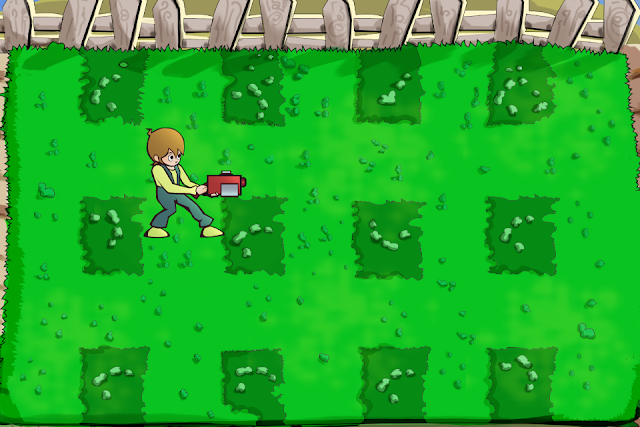 The other 2D artist on the team was given further environment tasks. Having done quite a bit of work at this point, individual members' strengths were showing through so the following tasks catered to those somewhat. I was given design work here, and was instructed to concept icons for the user interface. 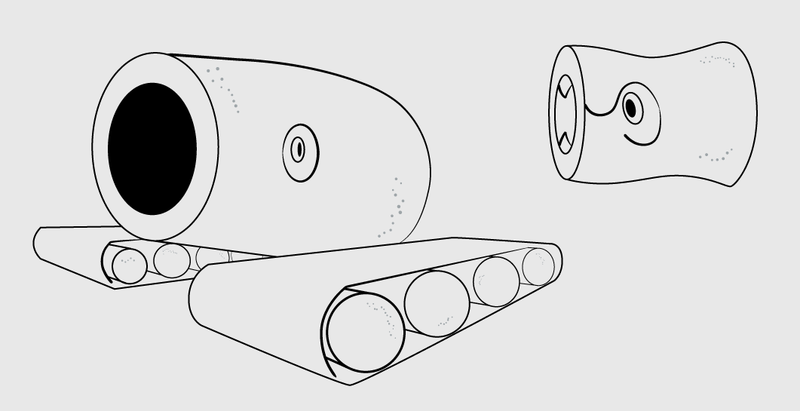 Working from a pencil sketch of my director's design notes I made these icons in Illustrator. These were placeholders--we were still in the concept and testing stage. 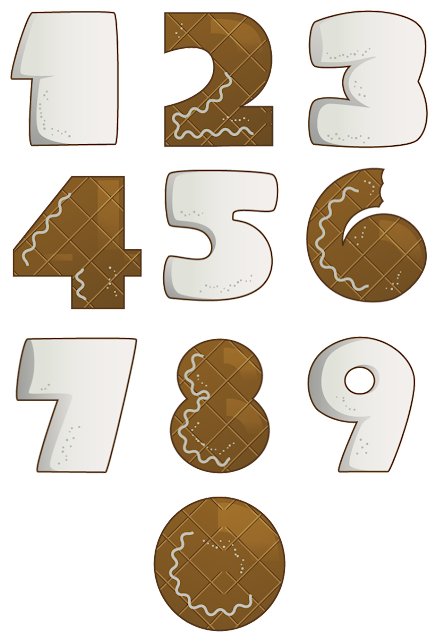 These represented what would later function as icons for various weapons and power-ups in the game the player could pick up from the field. I figured a glossy button look would make them more obvious as items to be picked up. Not perfect of course--here I learned that using too much black can make things look muddy/gritty, but the overall look was approved. I was more seriously studying light during this assignment as well, still trying to get a grasp on subsurface scattering. It was time to start putting things together. 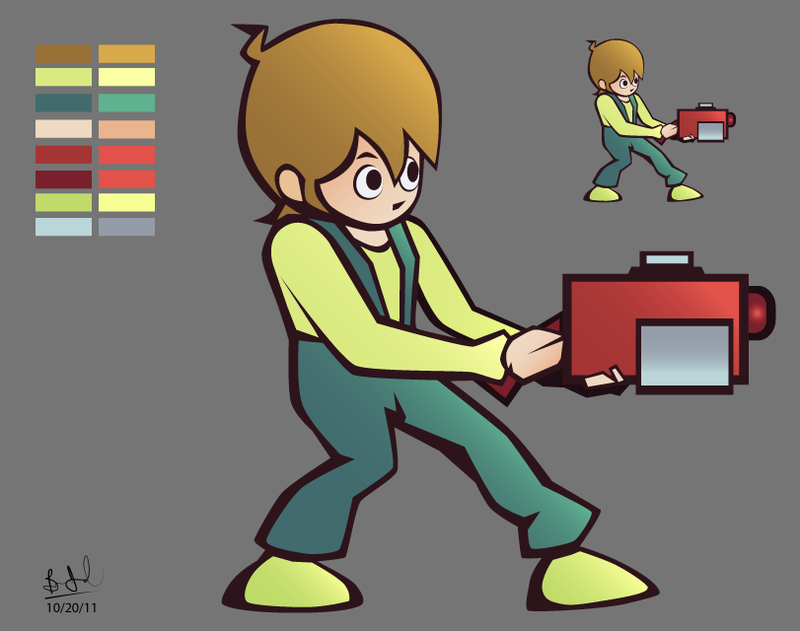 Next I was told to create a mock character sprite, one that was the correct size for the in-game field. Here's where I really learned about properly scaling assets for actual devices like the iPad. Fortunately, working in Illustrator meant that resizing was no big deal. The size was fine, but I ran into another problem--the importance of staying on model. The first character with the gray background is the character sheet my director made for me to follow. The second colored in character is what I made. As you can see, they... don't really look alike at all. He brought this to my attention and ever since I've been a lot more careful about character details following a model sheet. I understand the point after all of this is a certain level of professionalism in the artwork. Players would definitely notice if Mario's eyes were a different color, or if his mustache was drawn incorrectly--even if they couldn't tell what was wrong right at first. It would be weird if the character's appearance changed for no apparent reason. Lesson learned! I was also told to match the pose exactly with the design notes, which I promptly did. Even though it was... still off model. So we had a pretty good idea of what the player would look like on our field. He needed something to fight those oncoming hordes with though. So I was told to create weapon concepts, humorous in nature. Again, I was given a lot of freedom for this so I tried as many varied approaches as possible--close range melee weapons, long range projectile weapons... anything that might be useful in killing marshmallows. I tried to think of something I could picture a kid using to fight with in all of these which made it a bit easier to think of silly or asinine weapons. The developers looked at these and considered how easily they could be programmed into the game. I would soon return to design work to create the letters and numbers to be used for in-game text--things like menu words, showing the time/score, etc. Now I was beginning to think about how to really apply form to aspects of the user interface. A lot of custom fonts in games are like this, popping out from the screen instead of being flat shapes. I learned about making custom patterns/brushes and the Gradient Mesh Tool in Illustrator quickly during this assignment. More design work ahead: I had to create the logo for the game. No pressure, right? I'm still not particularly pleased with the end result, and if I were to go back and try again the main thing would be reference, reference, reference. I guess I should say proper reference--I did study several business logo designs (for some odd reason), but those tend to be a lot simpler looking. I should have looked at other game logos to get an idea of what people really expect from them. Another tough lesson learned here, but we got a logo nonetheless. Here's where I began to enter unknown territory: animation. Prior to this, I had zero animation experience though I had always had an interest in learning it on the side. The first animation assignment I received (and still the most difficult one by far) had me cleaning up the lines for the character's reload cycle. He was to load ammunition into the gun from his pocket. I have to give my animation director a lot of credit here. It was all very overwhelming at first, but he explained very clearly about keys, breakdowns, and in-betweens. He was able to answer my questions about where and how to start cleaning up the frames. Fortunately, I had been practicing clean lines in Photoshop prior to this so I had a pretty good idea of how to go about marking over his rough draft frames. Once I began working, things started to click and, even though I was pretty much exhausted after this was done, I knew I wanted to learn much, much more about animation. I began reading Richard Williams' The Animators' Survival Kit around that time and it's still an interest I'm pursuing to this day. Proof that tasks that really push you past your limits are the ones that teach and influence you the most. 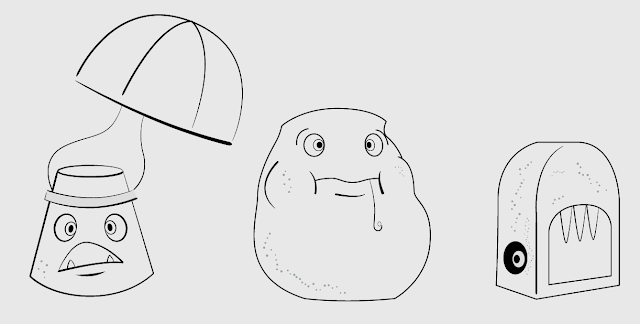 I was much more careful about following the model sheet this time around. From there I was eager for more opportunities to practice animation, which was all well and good since the next step was cleaning up the walk cycles for the enemy units. A similar process as the reload cleanup. I think it was good that the more difficult cleanup came first since it made these assignments that much easier to complete. Although I did learn that animating a checkerboard clothing pattern in motion was, well... easier said than done. I was learning and thinking about how to keep consistent volumes and avoid that flickering when the frames vary too much. We had a pretty solid game even at this early stage. 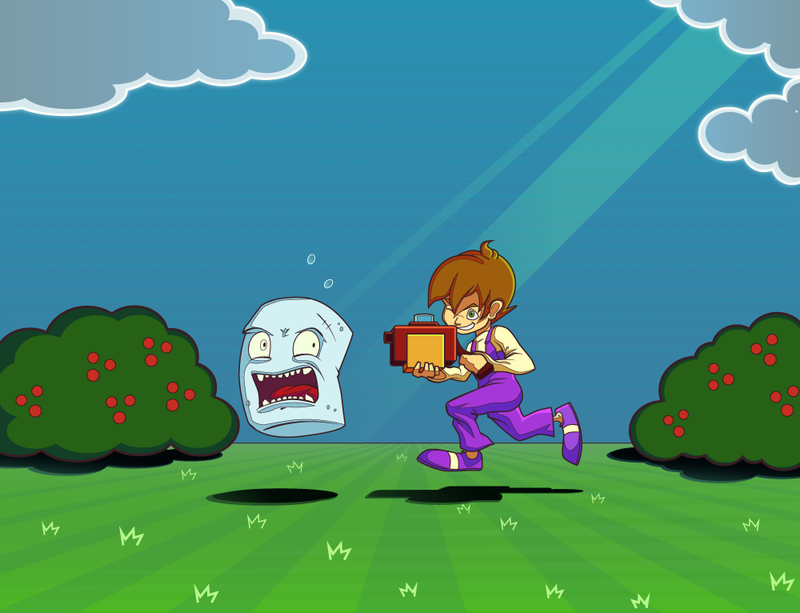 We had sprites for the character, moving enemies, and fields for them to fight on. 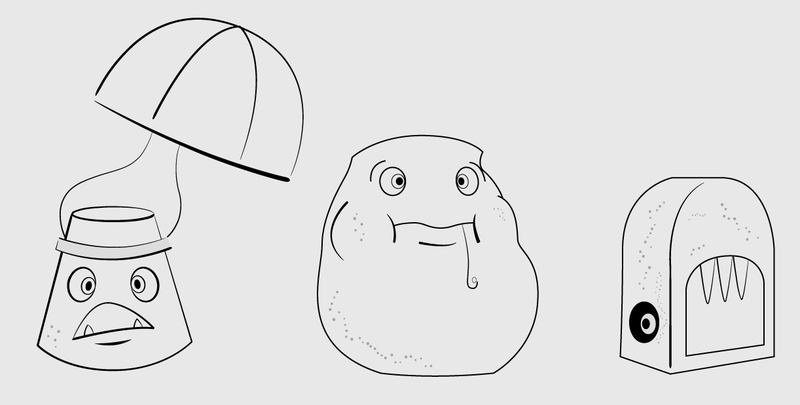 At this point I had a small hiatus from animating and went back to design work. We still needed a bar to hold icons for the player's weapons and belongings. It had to match the wooden look of the game logo, and hold space for circular icons. Fit for iPad specs, this was to go at the bottom of the screen. I didn't want it to take too much room... I think people will probably be more interested in what's happening on the actual field. The enemies were moving, but they needed to be colored as well. I was given the task of coloring the walk cycles for various enemy units. I colored these in Photoshop as well, using vector shapes for each frame. Fairly simple assignments since the cleaned lines were already done, more time consuming than difficult. With this we had colored moving enemies in the game. I got the chance to do something a bit closer to illustration afterwards, given the task to complete the look of the ending credits background. 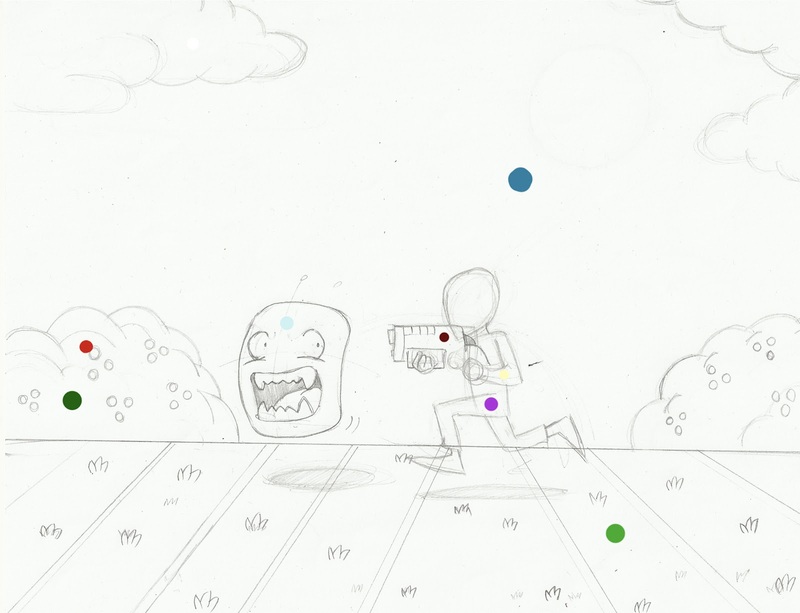 Working from a basic pencil sketch from my director with color guides, I was able to make a background image for when the player completes the game. My final assignment was to design the gadget icons that would appear in the player's status bar at the bottom of the screen. I ended up using the Gradient Mesh Tool in Illustrator extensively for the shiny rim/bubble look, while maintaining a cohesive style for the icons themselves. I can only hope that anyone reading this learned as much about the beginning-to-end process of building a game, from an artist's perspective at least. I've had a taste of being an illustrator, animator, and designer whenever I was called to do so. Now that I have an idea of how it's done, the next step is really just figuring out where I want to go in the video game industry, and what I can bring to the genre.